Respect Zone collaborates with UNESCO in the implementation of MIL CLICKS. 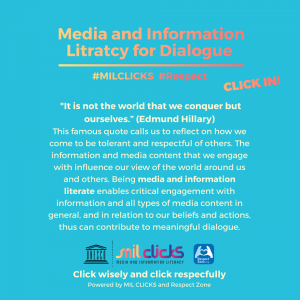 MIL CLICKS is a social media innovation led by UNESCO. The objectives of this social media strategy are to use social media to: 1) Expose people to become more media and information literate and 2) Raise awareness about the importance of media and information literacy (MIL). For more information, click on UNESCO website.